There’s one fast rule we have told our Precious Daughter about living in a neighborhood of empty houses: stay out of them. Our corner of post-Katrina New Orleans is dominated by empty houses. The western boundary of Vista Park is the London Avenue Canal, one of the canals that could not hold Katrina back. Many of the houses remain, almost 16 months later, decimated and dormant, left to waste away like carcasses in the wilderness. We told our girl to stay out of these empty houses for two reasons. First, and most obviously, is for safety. I know that there are still looters about. I know that there may be vagrants or unscrupulous contractors helping themselves to what is not theirs. I haven’t heard of anyone around here being attacked or hurt in such a manner, but I don’t want my Precious Daughter to be the first. And then we told her to stay out of the empty houses because they still belong to someone. They may be ruined almost beyond recognition, their decomposing contents ripped out and disposed like fish guts, but they are still the houses of our neighbors. Most of these houses are unsecured with windows knocked out and doors removed or left wide open. But this does not constitute an invitation or even permission to anyone to just come on in. I know some folks on Pratt Drive went so far as to post signs on their decimated homes warning the tourists to STAY OUT. Tour buses still rumble by those houses (and even sometimes past my own FEMA Travel Trailer). These folks don’t mean to be a nuisance and perhaps their curiosity simply gets the best of them. Still, I completely understand the need and right of my neighbors to enforce simple decency and respect for other people’s property. And yet, I confess that once a house is demolished, once it is smashed into a pile of refuse to be hauled off, my curiosity gets the better of me. I rationalize that once the walls are down and the roof pulverized, it really doesn’t constitute a “home” anymore. More than once, I have come home from work to find a mound of brick and boards where there once was a neighbor’s house. More than once I have given in to the morbid interest of seeing what else is trapped and tangled in the construction debris. 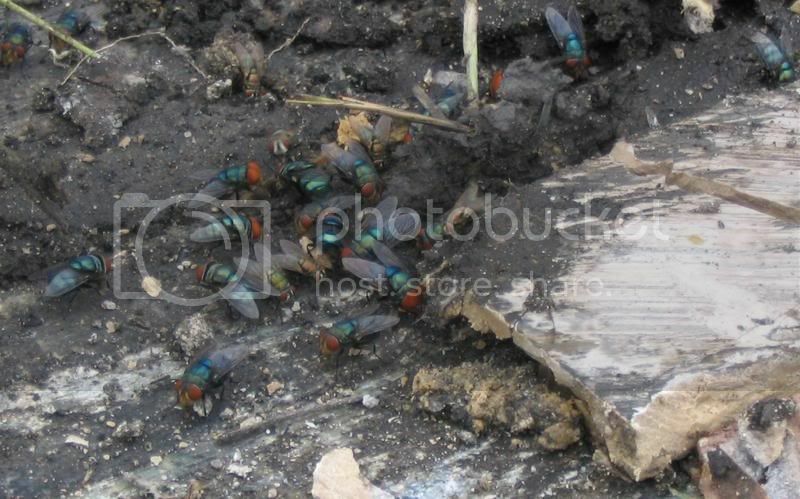 What is it I find? It is books and magazines, photographs and letters, phono albums and computer diskettes, dishes and silverware, pots and small appliances—all the gumbo of what used to be part of the nourishment of living in America today. It is a horrible image to see all this wasted and ruined and just waiting for the final trip to the graveyard, but I can’t look away. The experience is different from seeing my own home demolished. When I looked into my own pile of debris, I recognized most of it—a painting that used to hang in the living room, a doll that used to reside on my Precious Daughter’s bed, a hook that used to be on the back of the bathroom door. A recent mound of former house I inspected included hundreds of cancelled checks dating back to the 1970’s. An archeologist might find it an interesting exercise to piece together that string of cancelled checks to learn something about the family that used to live here. But I am no archeologist. I can only infer that these things were once important, perhaps significant possessions. Another had a collection of battered classical records, some still in their paper sleeves and cardboard jackets, as if at any moment their owner would lovingly slip them out and carefully place them on the turntable. But the collector of this music is long gone. These records, like the houses in which they once resided, are now permanently silent. When I look at the remains of others’ homes, I sense the importance of the items, but instead of sentimental attachment, there is burning curiosity. Where did that vase come from, and where was it displayed? Who is that in these photographs, when and where were they taken, and where are these people now? What present accompanied this gift card? These questions remain unanswered, lost in the ebb of time and the flow of relentless, invasive, destructive floodwater. These houses and this debris are rapidly on their way to being permanently discarded and all but forgotten in the panorama of time. Nature has one hard, fast rule of her own: Nothing remains the same. Dennis Persica used to live near here. His house was on Pratt Drive, directly across the street from where the London Avenue Canal floodwall was pushed over by Hurricane Katrina's storm surge. He writes in today's edition of The Times-Picayune about how much life has changed in the past year and some months, but yet how little the neighborhood has changed (i.e. been repaired) in that time. I live here, and I recognized some months ago that I have become acclimated to the destruction in this part of New Orleans. Immediately after the storm when I lived in the relatively unscathed sliver by the river, every trip to my house and my old neighborhood strongly affected me. But since moving back to the old address, taking residence in this government-furnished, bright white box amid the mud-stained houses, I see these gutted, vacant homes every day. Out of necessity, I know I have developed emotional calluses to shield me from the sadness. I don't think I've ever met Dennis. But we share such similar experiences and cling to such fragile hope that I think of him as a good neighbor--even though he now lives all the way on the other side of the river. In this post-K world of heartbreaks and undaunted hope, we are kindred spirits. Dennis, thanks for all you do. I often defer to the sage advice, "All things in moderation." It's advice that at least some in the bureaucracy of government disaster assistance are trying to follow. A colleague of mine has been working side-by-side for the past few months with local and federal government officials in St. Bernard Parish. Affectionately known as "Da Parish" around here, St. Bernard is a string of communities lined up alongside the Mississippi River downstream from New Orleans. To give you a picture of what Hurricane Katrina did to St. Bernard, all you need to know is this: Da Parish is south of the Ninth Ward, miles closer to the open water of Lake Borgne and Katrina's massive storm surge. A lot of the water that flooded the Ninth Ward went through St. Bernard to get there. I have seen a video, taken by a hard-headed fellow who decided to stay and document Katrina's arrival, which includes rather frightening footage of cars being carried down suburban streets by a brisk and muddy current. 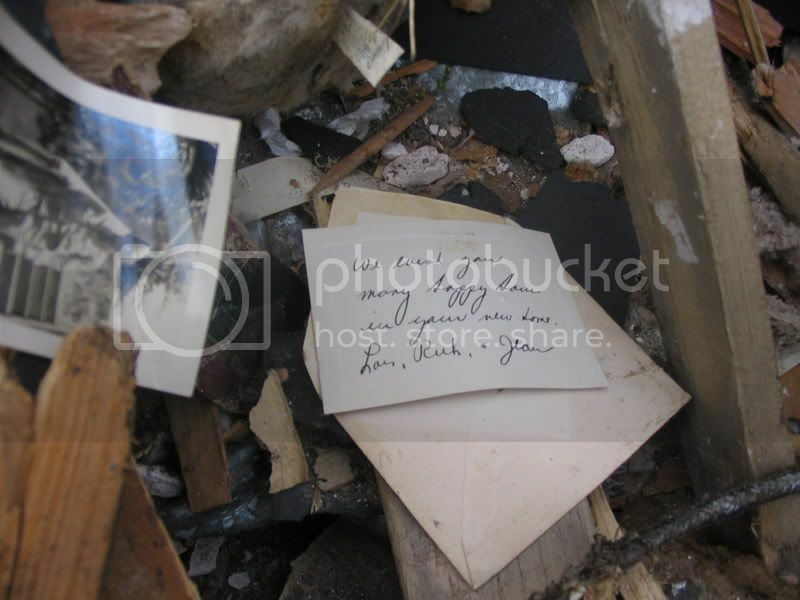 Few homes were spared the flood. Many two-story homes got a foot or more water on the upper floor. But folks who live in Da Parish are not allergic to hard work or to adversity. St. Bernard is where Andrew Jackson and Jean Lafitte joined to repel the British in 1815. That fighting spirit infects everyone down there to this day. And to their credit, the local politicians have put their hearts into helping rescue and revive their communities. As reported in the online National Journal, efforts to simply demolish and remove flood-decimated homes have been bogged down in rules, regulations and paperwork. For instance, no house can be demolished until a FEMA historian or archeologist inspects the property and gives the green light--even recently built homes. As Jonathan Rauch writes, "...even debris -- including, for example, 1,600 tree stumps -- had to be reviewed for archaeological value before FEMA would pay for removal." 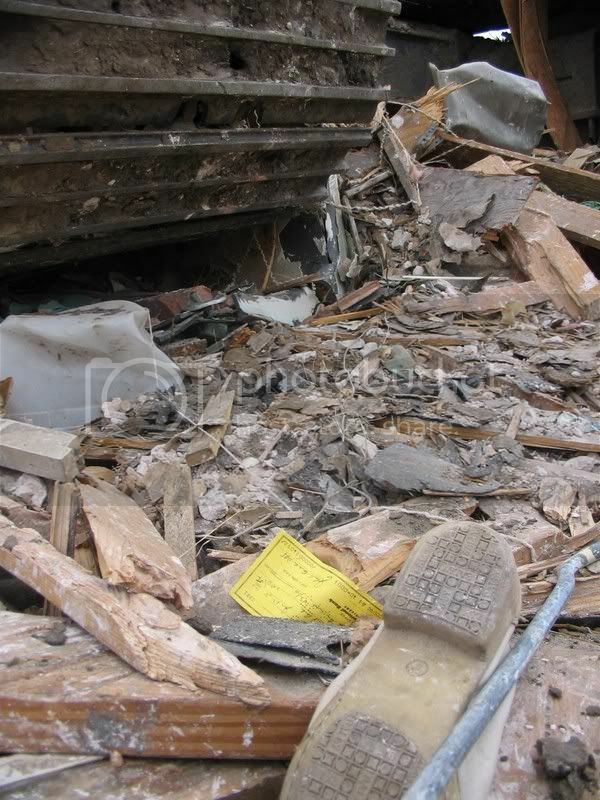 How can a community rebuild if they can't even get the debris removed? How can a community take advantage of federal aid for debris removal and rebuilding, aid which is timed to expire soon, if the paperwork takes up the majority of the time allotted? Do the words "emergency" and "extraordinary" mean nothing at all to these regulators? The current situation would be akin to a medic on the battlefield who arrives at the side of a wounded soldier, only to refuse treatment because of unsanitary conditions. It's an emergency, guys! The Army teaches its soldiers to adapt, improvise and overcome. We could use some of that kind of thinking right now. A similar mindset appears to be bogging down direct federal aid to storm victims. Yes, we're all concerned about waste, fraud and abuse. Yes, we should take steps to minimize theft of aid money. But we must balance those safeguards against the urgency of the situation and the desperate need. As we all know, it's difficult to arrest, try, and convict someone of a crime. The more serious the crime, the more onerous the process. Frankly, the rules are stacked in favor of the alleged criminal, and we know that a lot of criminals get off with no punishment. But we accept this because the thought of sending an innocent person to jail, or worse, to death row, is distressful an order of magnitude even more horrible. Succinctly, we tolerate and accept lesser injustice to preserve a greater level of justice for all. This same reasoning must be brought to bear for hurricane victims. There is no time to process wads of paperwork and run background checks on every applicant. There also can be no reasonable expectation that victims can navigate the confusing and time-consuming rules, deadlines, forms, submittals, phone calls and office hours--all this while at the same time maintaining a demanding life of work, school, family, housework, and on and on. The lucky ones have spare enough time to grieve. Look, I'm a college graduate and I think I'm pretty good at reading and following directions, but I still haven't completed my SBA Loan paperwork, and I'll be damned if I can figure how much assistance, if any we'll be getting from the Louisiana Road Home program. Why can't we just look at the map, consult the tax rolls, and mail a check to everyone? Would that be more equitable, or would that be too generic? Probably the latter, but we need to judge not only fairness but timeliness. It would be much, much faster, and in the current emergency I say it would be better than the current Louisiana Road Home program. I know this a lot to chew on, and I know this post is a bit of a curve ball in contrast to most of what I post. But I've had these things on my mind, and I think you should have these things on your mind, too. Bottom line: we're rebuilding this city RIGHT NOW. I'm lucky enough that I think I can pull it off with just some minor assistance. I did my stint in the Army and I learned to adapt, improvise and overcome. Like my friends in Da Parish, I suppose I'm too stubborn/proud/determined to ever give up. But a lot of folks are not so fortunate. A lot of my neighbors can do nothing until the bureaucracy decides how much, if any, aid they'll be getting. In the meantime, every day of waiting makes it more difficult for everybody. It’s almost true. No, we didn’t arrive on the Mayflower or strike out across North America in a prairie schooner. But we are among the first people to resettle this part of the city--a part of town where the closest restaurant is a pizza wagon parked in the driveway of a still-shuttered gas station, and where there are still more people living in FEMA travel trailers than in their houses. This “pioneer” spirit teamed up with a run of cold weather recently to inspire me to cook a pot of “Sons of the Pioneers” chili. It was a frigid, windy night last week when I decided to play frontiersman. I had to improvise some of it. I don’t own a hat or saddle, and I substituted a propane stove for an open campfire, and two domestic cats for horses. But that’s not what it’s all about. Our here, it’s the grub that counts! 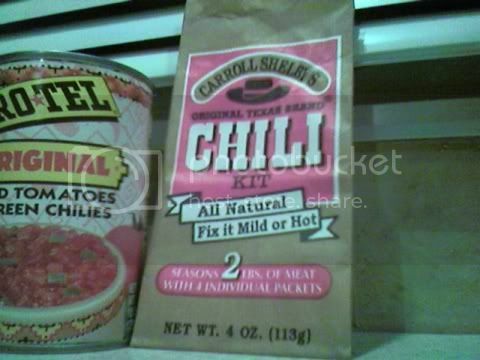 So I started with Carroll Shelby’s Chili Kit, a can of diced tomatoes and two pounds of lean ground beef. 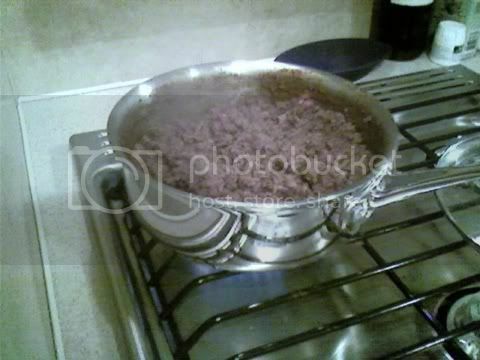 I can’t exactly say I made a big pot of chili because we don’t really have any “big pots” in the trailer, but I pulled out the biggest I could find and I started browning the meat over the open flame. I added the spices and flour paste as directed on the package. Because of our hypersensitive smoke alarms, I had the hood fan blowing the whole time. Still, somehow the trailer managed to fill up with that beefy, spicy chili aroma. 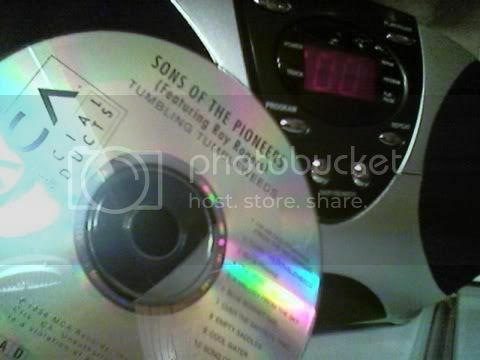 To really get into the mood, I put on a “Sons of the Pioneers” cd while I cooked and ate. Okay, so it’s not real cowboy music. The Sons of the Pioneers, whose most famous member was Roy Rogers, are actually Hollywood cowboys. But that’s okay, because I’m not a real pioneer either. Besides, that’s not what counts here. In New Orleans, it’s always about the food. And lemme tell ya--it was good vittles! More than 15 months after Hurricane Katrina ravaged the coast and New Orleans, we remain in dark times. Rows of houses that once glowed in the early evening with the warm light of family and community now sit dark and cold in the blighted neighborhoods of the city. Their windows, like empty eye sockets, stare blindly at the streets that are for the most part devoid of life and passersby. Street lights and traffic signals are a not a given. Some whole streets grow dark when the sun sets and stay dark. Some intersections simply blink with tentative reds and yellows all day long; nobody gets the green light here. The street lights of my neighborhood, Vista Park, are for the most part operating. But the houses remain unlit. The chill that moved across New Orleans this week personifies the lifeless state of homes here. Repaired homes are few, and FEMA travel trailers are widely spaced along the suburbanesque streets. But squatting conspicuously (almost defiantly) amid the destruction, is our boxy little FEMA travel trailer, lit up like Times Square. It’s one of those odd turn of events: because the flood water stopped just inches from the ceiling of our former home, we lost most everything except what was in the attic. We might not have the furniture and the records and the books and the clothes and the linens and the mementos and the pots and pans and every-damn-thing-else of sentimental and practical value, but doggone it—we’ve got Christmas decorations! This weekend, I climbed a ladder and strung five strings of “icicle” lights all the way around our cubist abode. My Darling Wife thinks it makes the place look beautiful. 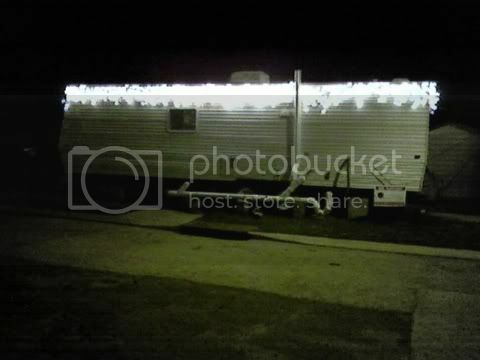 It was an odd feeling, putting up those same lights that used to ring my house on a trailer, a borrowed trailer that sits just twenty feet from where my home used to be. All around us sit the empty, rotting carcasses of the flood-ravaged homes or the wide vacant lots where the houses have been removed. The full moon paints their decomposing shells in a melancholy patina. But here there is light and life. As we approach the deepest, darkest day of winter, we join in the worldwide celebration of the season of lights. Like so much I do in New Orleans post-Katrina, it’s a sad but celebratory moment. A chance to recall once again how much is lost, and how much remains. A chance to remember that it’s not at all about the buildings--the mere wood and bricks and glass and carpet--that made this a nice neighborhood. It was the warmth and light of the people that made these houses special, that made this city shine. No, there are not a lot of lights here. But there are certainly more than last year, and less than next year. For now, this bright little FEMA travel trailer will have to suffice.